In an article with Whidbey-News Times, Deb Lund described sharing picture books as "more than words; its an experience for families." I couldn't agree more! 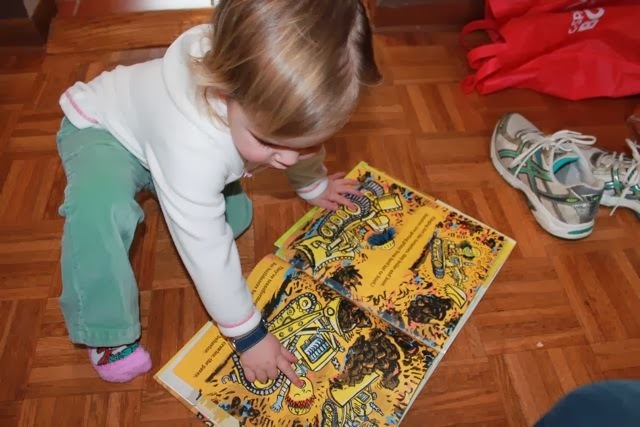 Picture books are unique in their ability to grab a family's attention, spark a family's imagination, and connect a family together. 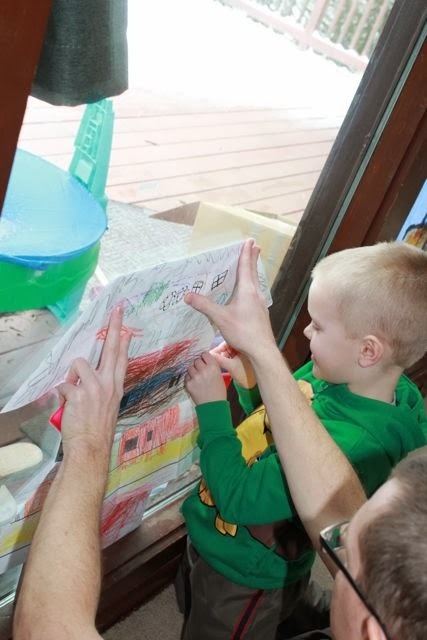 This week, Deb Lund's picture books did all of that and more for our family! Deb Lund is an author, teacher, and mother of three children. In a blog post she wrote back in 2004 she said, "Even though I duck in and out of family, writing, and teaching the three are woven together in ways that can't be separated." Early in her career she worked as a classroom teacher, an elementary librarian, and even created and co-directed a school. Her writing was something that she didn't get serious about until she had her own children. At the age of 40, Deb took time off from teaching to focus on writing for children and got her first book contract for Tell Me My Story, Mama which was about the birth of her son. (Book Bites for Kids and deblund.com). She went on to publish Monsters on Machines and a popular series of picture books about dinosaurs which includes Dinosailors, All Aboard the Dinotrain, and Dinosoaring. 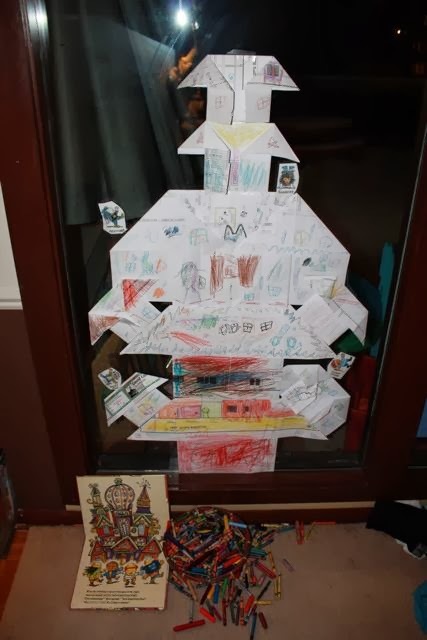 Now, Deb continues to write while raising her growing children, and supports writers and teachers through her blog, school visits, and workshops. Birthdays at our house (and most of my friends' houses) meant playing games like Drop the Clothespins and Pin the Tail on the Donkey. This year, let's change that to Drop the Dinosaurs and Pin the Monster on the Machine. On my 7th birthday, I wanted only girls to come to my birthday party, but my friend Stewart's mom called my mom because Stewart was home crying because he wasn't invited to my party. You probably guessed this, but he ended up being the only boy at that party, and I remember the pretty jewelry he gave me -- even if I was more of a tom boy than a girly girl. To this day, he still likes to tell a story about me trying to catch and kiss him, but that's totally not what I remember at all. It was the other way around, and I ran away from him! 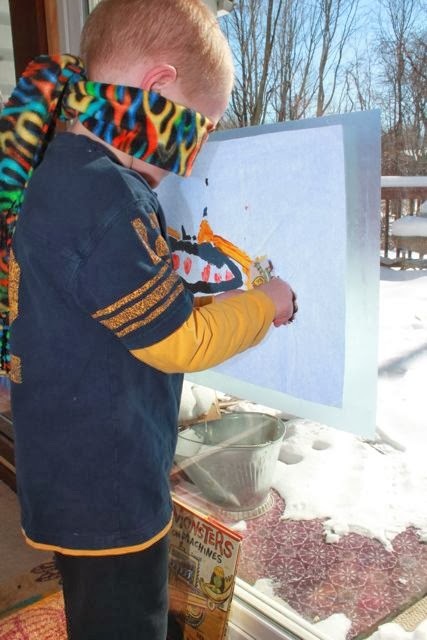 My favorite birthday parties happened on very cold northern Minnesota February days -- outside! My friends and I would meet at a hill that sloped down onto a frozen lake right in our little hometown. We'd fly down that hill on our toboggans and sleds until our faces were bright red from the cold and we couldn't feel our fingers or toes any more. My mom would pick us all up and serve us hot chocolate with our cake and ice-cream. As an author, elementary librarian, and teacher, it's been fun to know I share a birthday with Laura Ingalls Wilder. And she was from the same part of the country as me. My dinos and monsters are thrilled to celebrate with you, and when I blow out my candles (there are so many of them! ), I'm going to make a very special wish for YOU! I can't tell you what it is, though, or it won't come true. If you send me an email, I'll let you know if I was able to blow out all the candles. 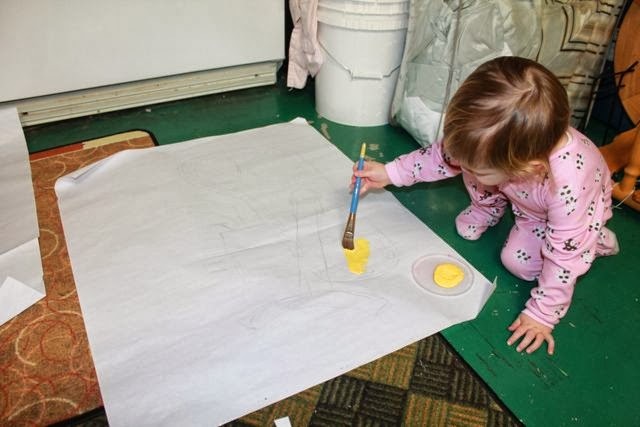 To begin, I drew a rough sketch of a bulldozer and my youngest daughter filled it in with yellow paint. 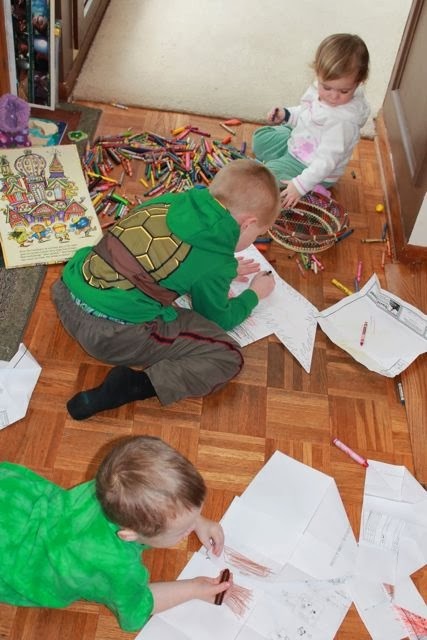 My older two children worked on coloring Dirty Dugg, Stinky Stubb, Gorbert, and Melvina. We found black and white drawings of the characters in a FREE Monsters on Machines coloring book available on Deblund.com! I painted the bulldozer's outline with black paint and then let the artwork dry. 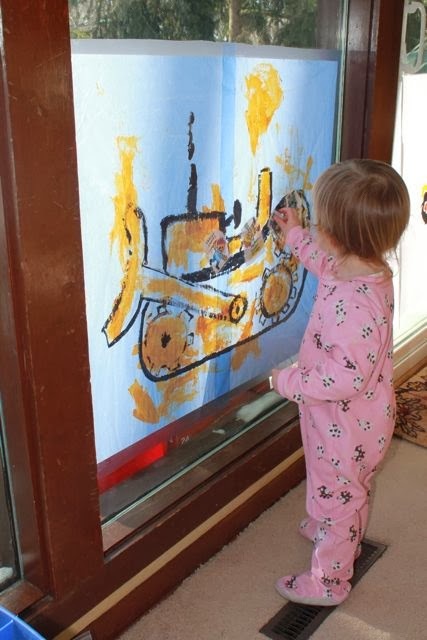 Once dry, we hung it on a window and covered it with clear contact paper. We laminated the four monsters and added glue dots to the back. My daughter tested to make sure the monsters would stick to the machine. I tied a fabulous new scarf that we just received from a friend around my son's head for a blindfold. Then, I gave him a couple of good spins and he laughed his way to the machine to pin on the monster. He painted a machine too! It was much smaller which made pinning the monster in the driver's seat much more challenging! Prior to Deb sharing her birthday memory with us, I had a different idea for bringing Monsters On Machines to life. 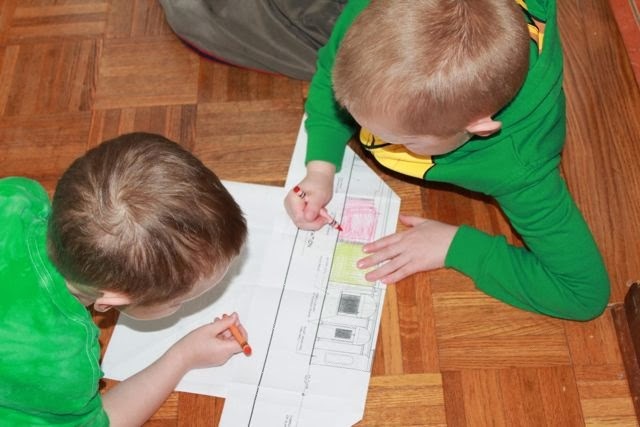 In the book, four construction crew monsters prepare the work site and ready the machinery to build a "CUSTOM PREHAUNTED" house. 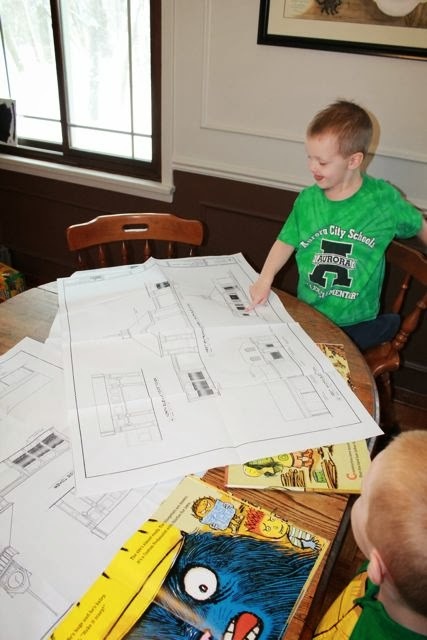 Foreman Gorbert and Dirty Dugg look over the blueprints before the work begins. The crew builds a house that is "frightfully fine!" faster than you can say, MONSTERS ON MACHINES! Then, after a hearty lunch of monsteroni and cheese, a quiet time book with Mama, and a nap, the monsters work together to finish up the job by adding a little curb appeal. 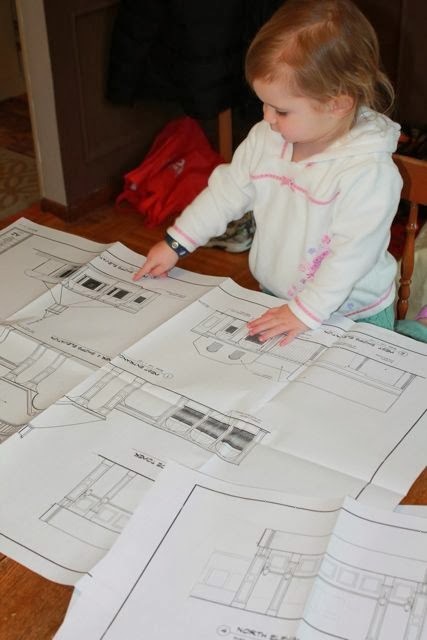 My youngest daughter enjoyed looking at the blueprints too. 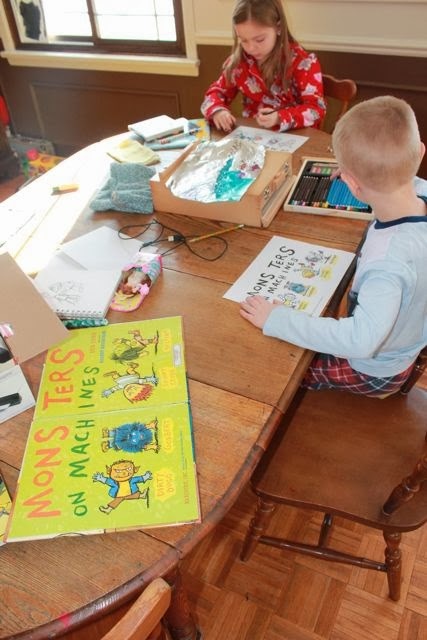 While my son and I folded a few houses, my daughter reread MONSTERS ON MACHINES! 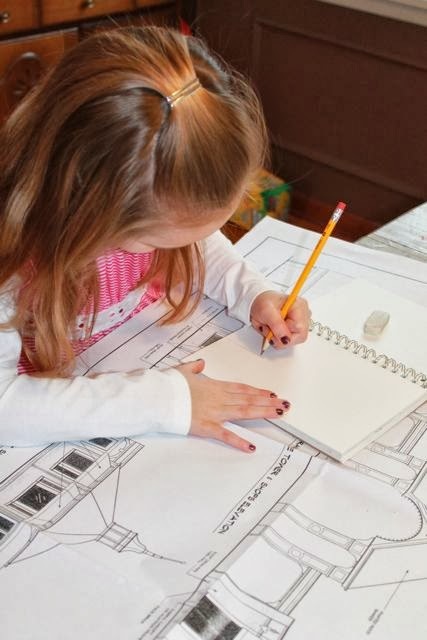 My oldest daughter was interested in sketching her own "CUSTOM PREHAUNTED" house in her sketchbook. Since this initial sketch she has created a two-page-spread illustration of "Rosa's Cafe". We asked where the name "Rosa's Cafe" came from and she responded, "I just made it up." 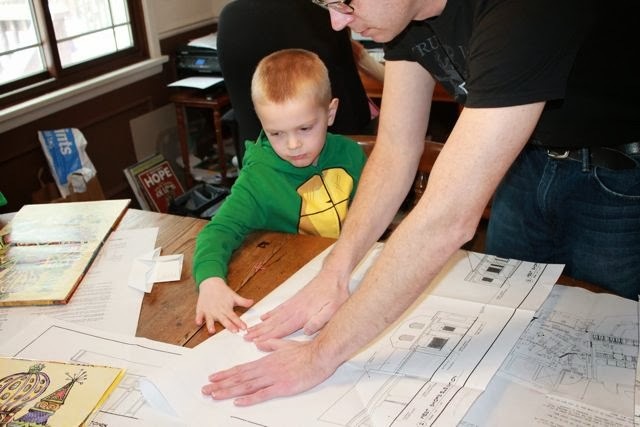 My boys colored the blueprint-origami-houses using "colors that clash." These little monsters worked together just like Melvina, Gorbert, Dirty Dugg, and Stinky Stubb! 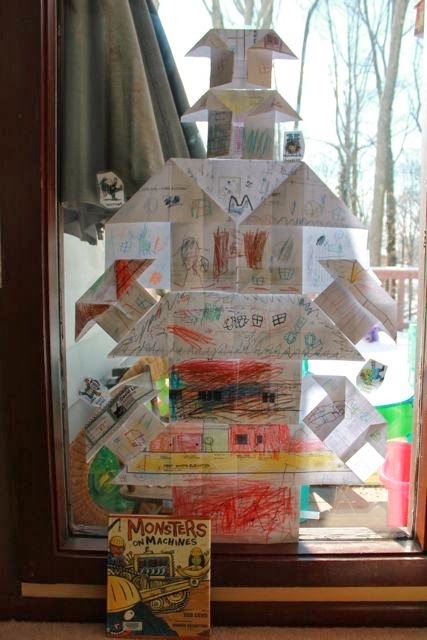 My son and I taped all the origami-blueprint-houses together on the window to make one TALL house. It was complete! 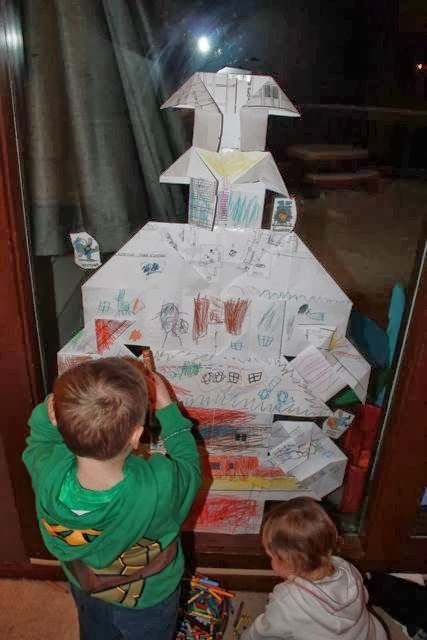 The finished haunted house had lots of windows, ladders, doors, and many hidden creatures. "How enchanting!" "How spooky!" "How frightfully fine!" Are you on Pinterest? Follow Happy Birthday Author and pin this picture! Deb, my family hopes you have a wonderful birthday! We had a great week reading and experiencing your books! Thank you again for taking the time to share your birthday memories with all of us!